Beginning as part of the Fame Gang, a loose knit group of session musicians who worked under the direction of Rick Hall at Fame Recording studio, the Muscle Shoals Horns soon earned their separate identity by performing on many recordings made at a variety of studios in the Muscle Shoals area. Originally composed of Harvey Thompson, saxophone, Ronnie Eades, baritone saxophone, Harrison Calloway, trumpet and Aaron Varnell, trombone, in the late 60s, the group solidified in 1970 when Charles Rose filled the spot vacated by Varnell. The lineup remained together until the mid-80s, adding a variety of specialist from time to time. While primarily a studio horn section, the Muscle Shoals Horns toured extensively with Elton John in the mid-70s, playing on the famed "Philadelphia Freedom" recording, which also featured John Lennon. 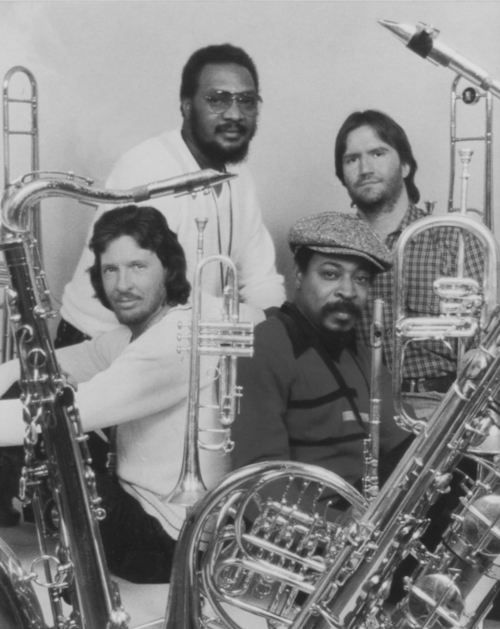 Later in the 70s, the horn section released three albums of their own compositions which capitalized on the disco dance craze, and they formed a band which toured opening for groups such as Parliament-Funkadelic, as well as headlining shows in smaller venues.